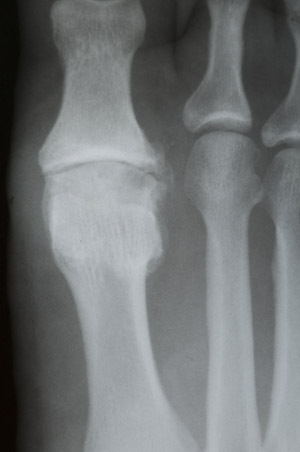 This is one of a series of articles discussing sesamoid injuries, hallux rigidus, hallux limitus, turf toe, and other, similar first metatarsophalangeal (MTP) joint injuries. The introduction is common for this series. In evolution, the abduction of the first ray, disappearance of an opposable hallux, and realignment of the first metatarsophalangeal joint and first metatarsocuneiform joint marked a complete change from arboreal living to obligate bipedalism. Ardipithecus ramidus, the oldest known hominid, had an adducted first metatarsal, opposable hallux, and was able to walk in a bipedal manner (Lovejoy, Latimer et al. 2009). As Australopithecus evolved with a more modern alignment of the great toe, developed larger gluteal muscles, continued to evolve a longer Achilles tendon, hominids became obligate bipeds and were able to run. Hallux rigidus refers to an absence of dorsiflexion at the first metatarsophalangeal joint. At times, the term hallux limitus has been used to describe the condition in which the dorsiflexion is not absolutely limited. Functional hallux limitus, was first described by Laird,(Laird 1972). Functional hallux limitus refers to biomechanical features of the joint which effectively limit dorsiflexion. Excessive pronation, a long first metatarsal, and several other factors may play a role in development of a functional hallux limitus. Functional hallux limitus is a condition in which no degenerative changes are present. It is thought to be one of many possible etiological causes of Hallux Rigidus. Grading systems which use both biomechanical features and x-ray criteria are helpful to stage hallux rigidus. The most useful classification system for hallux rigidus was suggested by Roukis (Roukis, Jacobs et al. 2002) and combines criteria from the systems of Drago, (Drago, Oloff et al. 1984) Hanft, (Hanft, Mason et al. 1993) and Kravitz (Kravitz 1994). The following table describes a modification of these approaches. Hallux rigidus is a progressive disorder of the first metatarsophalangeal joint. Starting with a mild limitation of dorsiflexion and little to no discomfort, it can progress to a condition that causes marked limitation of motion at the joint, pain during athletic participation and ultimately pain while walking. 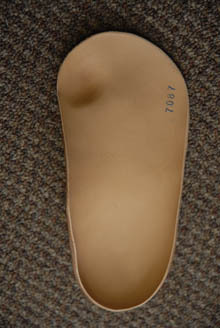 Shoes press on the dorsal (top) aspect of the joint and cause pain. Open back shoes and sandals can create discomfort because of the increased motion at the first MTP joint that is caused by those shoes. Pain in hallux rigidus is caused by the degenerative arthrosis (joint destructive processes, loss of cartilage, bone spur formation, etc.) of the joint. Proliferation of bone and cartilage at the dorsal aspect of the joint contribute to the limitation of movement. Cartilage degeneration and osteophyte formation are caused by abnormal, repetitive contact of the joint surfaces. The sesamoids often are an additional source of pain. “... the sesamoid bones are often an additional source of pain..."
increased dorsiflexion at the ankle and increased knee flexion. Athletes change their running gait so that they run more toward the outside of their foot. These compensatory gait changes can lead to other injuries. Central metatarsalgia is often found as weightbearing forces shift laterally. A large dorsal exostosis can cause pain from the pressure of rubbing against footwear. Pain and occasionally hyperkeratoses (hard skin) may develop at the interphalangeal joint in association with compensatory dorsiflexion. Most patients with early stage hallux rigidus complain of pain in and around the first MTP. Dorsal pain at the joint is often the primary complaint. The patient doesn’t usually report “stiffness", but the range of motion will usually be limited. Further examination will often find tenderness in one or both hallucal sesamoids. X-ray changes are minimal. Patients with severe symptoms should try a brief course of immobilization followed with off loading the joint using functional orthotics with forefoot modification. NSAIDS can be useful in the initial stages. Ice is a useful adjunctive therapy. Activity level should be decreased as needed. Steroid injections at the joint will not offer a long term benefit for athletes. If a steroid injection is used the athlete should not participate in sports for 48 hours. Stages 1 and 2 can often be successfully treated with functional orthotic therapy. The goal of the functional orthotic is to improve first ray function by enhancing stability and limiting dorsiflexion of the ray. The design of the orthotic should allow the first metatarsal to maximally plantar flex. This allows the first MTP to be in a more relative dorsiflexed position towards the latter stages of stance. Less abnormal motion will take place at the first metatarsophalangeal joint and there will be a less sudden abutment at the dorsal aspect of the joint. Other techniques to off load the first ray. Surgical solutions may be needed at Stages 3 and 4 if conservative care fails to relieve pain. The most popular surgical solution for Stage 3 is Chielectomy. In stage 4 arthrodesis of the joint or joint replacement may be required. Conservative therapy can still be useful even at stages 3 and 4. For more information see the references below and Pribut (2010) from which much of this article was adapted. Cotterill, J. (1888). "Stiffness of the great toe in adolescents." Br Med J 1: 1158. Davies-Colley, M. (1887). "Contraction of the metatarsophalangeal joint of the great toe." Br Med J 1: 728. Drago, J. J., L. Oloff, et al. (1984). "A comprehensive review of hallux limitus." J Foot Surg 23(3): 213-220. Dutra, T. (2004) "Inside Insights on Orthotic Modification For Sports" Podiatry Today 17(10) October 2004. Hanft, J. R., E. T. Mason, et al. (1993). "A new radiographic classification for hallux limitus." J Foot Ankle Surg 32(4): 397-404. Kravitz, S. R., LaPorta, G. A., Lawton, J. (1994). "Progressive staging classification of hallux limitus and hallux rigidus." Lower Extremity 1(1): 55-66. Laird, P. O. (1972). "Functional hallux limitus." Illinois Podiatrists 9(4). Roukis, T. S., P. M. Jacobs, et al. (2002). "A prospective comparison of clinical, radiographic, and intraoperative features of hallux rigidus." J Foot Ankle Surg 41(2): 76-95. Vanore, J. V., J. C. Christensen, et al. (2003). "Diagnosis and treatment of first metatarsophalangeal joint disorders. Section 2: Hallux rigidus." J Foot Ankle Surg 42(3): 124-136.